Small magnets used to connect the wooden pieces to the sides of the townhouse can fall out, which can then be swallowed by young children. If more than one magnet is swallowed, the magnets can attract each other and cause fatal injuries. 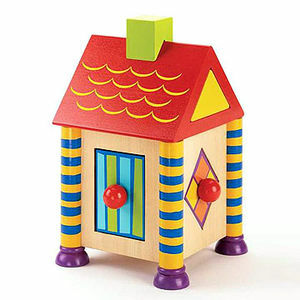 This recall includes about 8,800 wooden toys that are shaped like houses measuring 8.5 inches high by about 4.5 inches wide. They have nine pieces that children can disassemble and reassemble. Each house has a green chimney and a blue and yellow striped pillar with a purple base at each corner. The sides of the house have four removable panels of different shapes with red knobs that children use to pull the panels off. "IQ Preschool" appears on the side of the house below the blue and green rectangular panel. Model number 2408808 appears on the packaging. Toy stores and various other retailers nationwide and through catalogs from December 2004 through February 2007 for about $21. Immediately take these toys away from children and contact Small World Toys at (800) 421-4153 between 8 a.m. and 5 p.m. PT Monday through Friday, visit their Web site at www.smallworldtoys.com, or e-mail them at townhouserecall@smallworldtoys.com to obtain a free replacement product.